Jim Brandstatter | Michigan Wolverines Football | Detroit Lions Football | Jim Brandstatter INC. Welcome everybody, and thanks for visiting! This is your spot for info on University of Michigan football, the Big Ten, and college football in general. We’ll also keep you up to date on the Detroit Lions and the NFL. While we are a bit football intensive, I may surprise you now and again with a comment on just about anything that's on my mind. Watch Inside Michigan Football on Ch-7 in Detroit and FOX Sports Detroit. 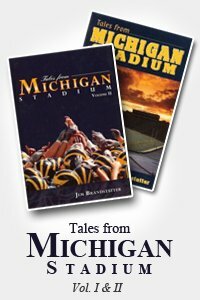 You can also get autographed copies of my books, Tales from Michigan Stadium Vol II. Hope you enjoy, and visit often!